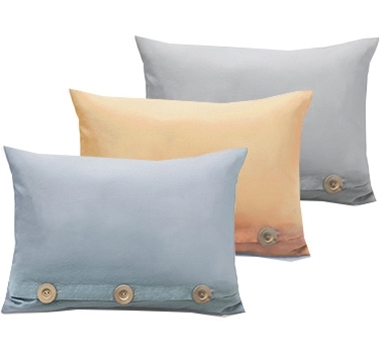 This chic Three Button Pillow is a décor chameleon, equally at home in both formal and casual living spaces. Three unfinished wood buttons close the pillow in front. This product comes with an organic insert stuffed with fibers from the kapok tree. These inserts are moisture-resistant, quick-drying, lightweight, completely hypo-allergenic, mold resistant and odorless.Handcrafted in California using 100% certified organic materials.